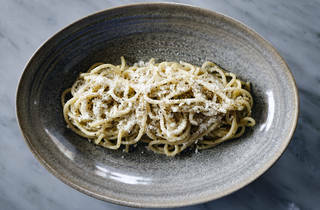 Last year, Evan Funke’s temple to handmade pasta set the pace for L.A.’s new restaurants. This year, it’s still in a league of its own. It may be one year in, but Evan Funke’s venture in Abbott Kinney still feels like a breath of fresh air. 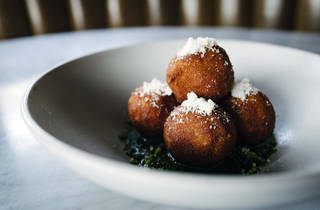 Opening at a time when I would’ve described most new L.A. restaurants as “Fifty Shades of Meh,” Felix Trattoria’s loud, lively and well-researched take on Italian cuisine was a welcome eyebrow raiser. Even now, after multiple visits and enjoyable, recent openings, the excellence of the food, service and wine list makes this the only restaurant which, so far, I deem worthy of that coveted fifth star. I’m not alone. Diners secure reservations months in advance, and then have to squeeze through a tiny bar area filled with people sipping amari, waiting for their seats or trying to secure one of the two tables designated for walk-ins. 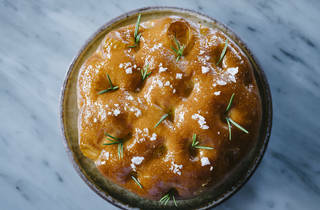 But, once seated, the sfincione—Sicilian focaccia topped with rosemary and sea salt ($8)—makes you realize that all the struggle is worth the effort. 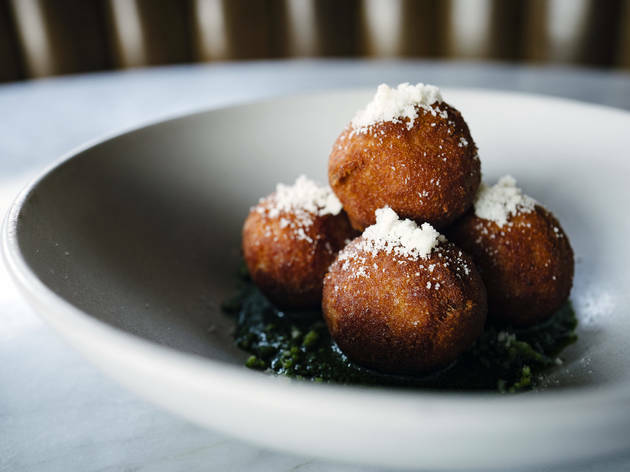 The same is true of the antipasti, of which the polipo (charred octopus, $25), the Polpette della Maestra Allesandra (pork meatballs with salsa verde and Parmigiano Reggiano, $18) and arrosticini (grilled lamb skewers, $20) are highlights. However, the truth is they—and the pizza offerings, terrific though they are—really exist as a prelude to the real reason Felix is so special. And that, of course, is the pasta. 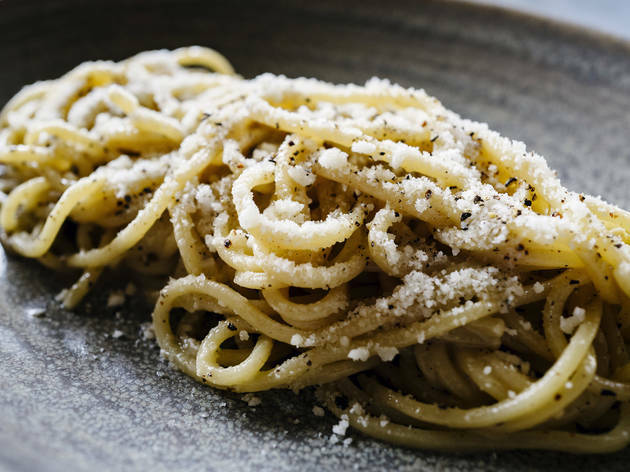 Over the last decade, Funke spent nearly two years in Italy studying the craft of making noodles, and here he recreates what he learned in a windowed “pasta lab” at the center of the restaurant. He imports six types of flour from three millers in Italy, all of which are ground to order. 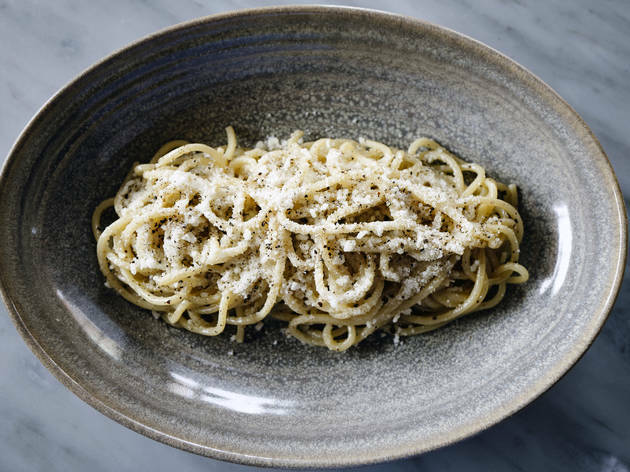 The menu is split into sections offering pasta from four sections of Italy: del Nord, del Centro, delle Isola and del Mezzogiorno. 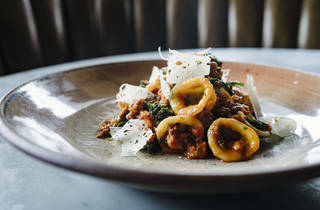 Work your way through the menu multiple times and you’ll still find yourself coming back to the pappardelle with a ragu bolognese ($48), the orecchiette with sausage sugo ($25), the tonnarelli cacio e pepe ($22) and the casulli with artichokes and guanciale ($26), all of which have a definite bite. 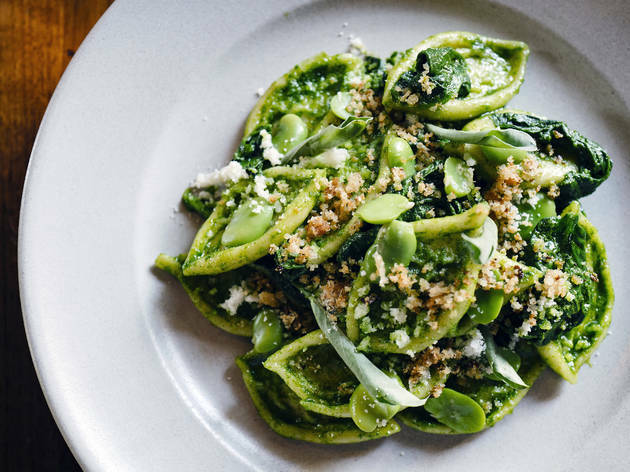 The al dente texture of the pasta—which gives way after a little resistance—has challenged some, but suits Funke’s unapologetically authentic style perfectly. The long-studied physics of the “too much pasta: too little stomach room” ratio means that secondi are often the forgotten stepchildren in Italian restaurants. This would be a mistake at Felix. If you can gird your loins, make sure to try the given variety of bistecca, or steak, such as the Bistecca Di Maiale Alla Boscaiola, a pork shoulder stuffed with wild mushrooms ($30), or the Tagliata di Manzo, rib-eye cap served medium-rare ($48). And, if that doesn’t polish you off, a dessert of budino ($10) is a gentle way to ease you out of your meal. If all of this joy seems unlikely from a curmudgeonly reviewer who usually thinks giving more than three stars is a sign of weakness, you’d be right. 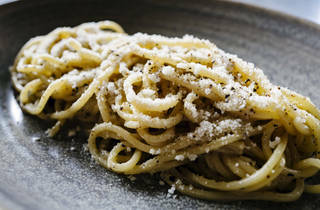 But, as of now, I’d be hard pressed to name a better restaurant in Los Angeles. And, heaven knows, I spend enough time trying. 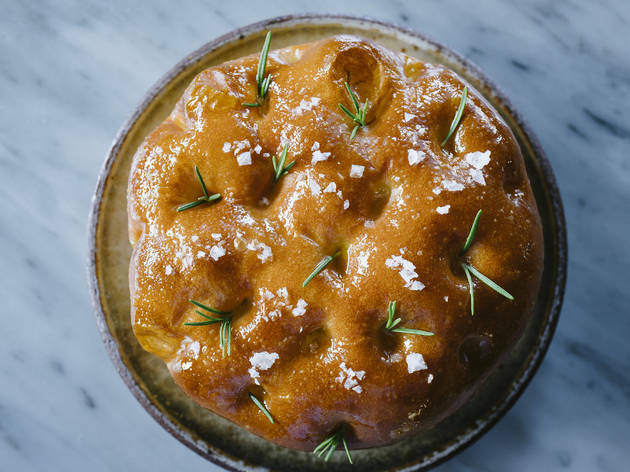 It doesn’t matter how into your Ketogenic diet you are: If you don’t eat a loaf of the focaccia and enough bowls of Felix’s cacio e pepe to fuel a runner before the L.A. Marathon, it’d be a foolish trip. 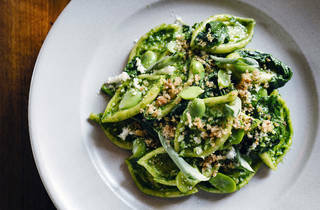 Try and secure a table with a view of the “pasta lab” if you can; the sight of Funke or his colleagues deftly rolling sheets of pasta will confirm what your mouth is already telling you: Pasta-making at Felix Trattoria is very serious business. The cocktail list is short but well done, but it is beverage director Matthew Rogel’s wine list that’s most fun to play with. It comprises an eclectic list of wines, with some interesting bottles from areas of Italy—such as Sardinia—where the wines get a lot less love than they deserve. The Felix frenzy has reached such heights that you'll have to book your table a month out, but never fear—the no-reservations-required bar offers the full menu. It also gets you closer to that impressive amari collection, and away from the buzzing and decibel-climbing dining room. 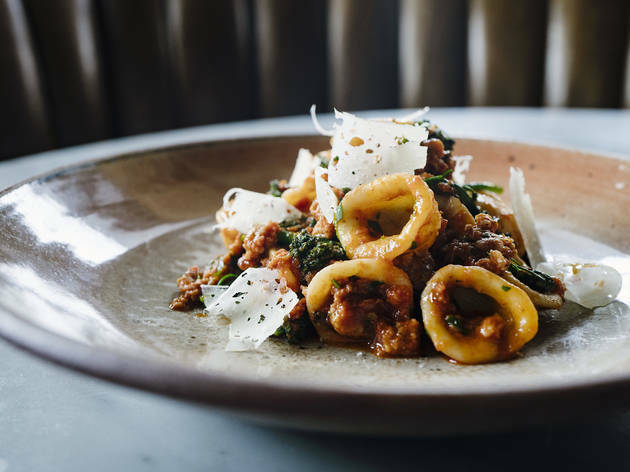 Evan Funke's temple to handmade pasta serves perfect al dente handiwork, plus pizzas and small plates; just be sure to get there early enough for the pappardelle, a dish so popular it has a tendency to disappear by night's end. I recently had to quit carbs for health reasons, and Felix was my last carb-heavy meal for a while. I definitely made the right choice. You can taste the dedication to perfection in each bite. I had the Rigatoni All 'Amatriciana' and the Pappardelle (yes, I ate two entire pasta dishes by myself) and wish I could have tried the whole menu. The drinks are handcrafted with the same attention to detail as the food. Reservations may be hard to come by, but the bar is usually pretty accessible for walk ins.